Here we show how to create a stacked graph with data sources from multiple nodes. 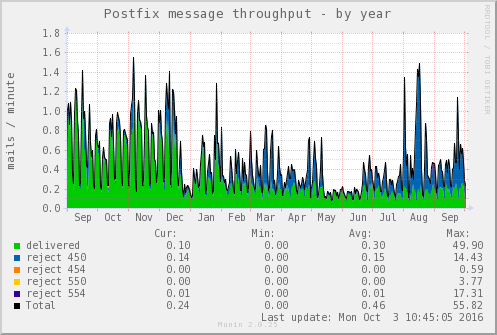 The example uses a plugin that monitors Postfix message throughput. The following extract from munin.conf is explained in detail, step by step, below the configuration. 1 - 2: Configuration of Node foo.example.com. 4 - 5: Configuration of Node bar.example.com. 7 - 8: Configuration of Node bar.example.com. 10: Define the name of the virtual node. The name of a node group can optionally be added here, e.g. “[Virtual; aggregates.example.com]”. 11: Make sure that munin-update does not try to actively gather information for this node. 12: Tell munin-limits not to send alerts if any limit is breached. The above lines (1 - 12) have now established the fundament for four nodes in the Munin tree; three real nodes delivering data on connect by munin-update and one virtual node for the aggregate graphs. 17: No fetch from node should be done for this virtual plugin (which is named implicitly herewith to “total_mailstats”). 18 - 24: Define the virtual plugin’s config in the same way as set for its ancestor plugin postfix_mailstats (see output in section Plugin involved above). 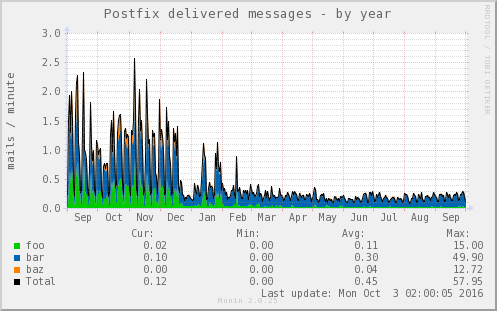 We set a different graph title though, as we graph only field delivered here. 25: The virtual plugin’s field itself will not show up in the graph but only the fields loaned from the real nodes. Therefore this hint that will be shown in the graphs legend. 26: Default type is GAUGE but we have type DERIVE here. So the field’s type has to be declared explicitly. 27: Values should be drawn as AREA and not as LINE for better recognition of small values. 29: This directive is the key that opens the door for loaning data sources from other nodes and plugins. As we choose option stack here, the values of the hereafter referenced data sources will show up stacked on each other in the graph. 30 - 33: Declare the virtual data fields as reference to the original data source in node foo, bar and baz. The string on the left side of the expression will be the name of the data field shown in the graph of this virtual plugin. Hint: If you need to reference a node that is member of a node group, then enter its name with the leading group name like “Group;node.name”.